The Second Saturday Documentary Series, in cooperation with Compassionate Fremont, the Tri-City Interfaith Council, and the Fremont Human Relations Commission, will present the documentary Waking in Oak Creek as the kickoff to “United Against Hate Week” in the Tri-Cities, the Bay Area, and beyond. The film will be shown on Saturday, November 10, at 1:30 p.m., at Niles Discovery Church. The free screening will be followed by a discussion, led by Pardeep Kaleka and Arno Michaelis. Kaleka’s father was killed in the attack at the Oak Creek Gurdwara and Michaelis is a former white supremacist who now works with Pardeep on an anti-violence program. Kaleka and Michaelis wrote the new book, The Gift of Our Wounds. It tells the powerful story of a friendship between two men – one Sikh and one skinhead – that resulted in an outpouring of love and a mission to fight against hate. They have appeared on CNN’s “Anderson Cooper 360,” the BBC, MSNBC, and “The View.” and in The New York Times, The Huffington Post, and The Washington Post. Another event scheduled in Fremont that week is a “Bystander Intervention Training,” which will be held 7:00-9:00 p.m., on Wednesday, November 14, at Temple Beth Torah, 42000 Paseo Padre Pkwy, Fremont. More events around the bay area are listed on the United Against Hate Week website, www.unitedagainsthateweek.org. Other cities followed suit. 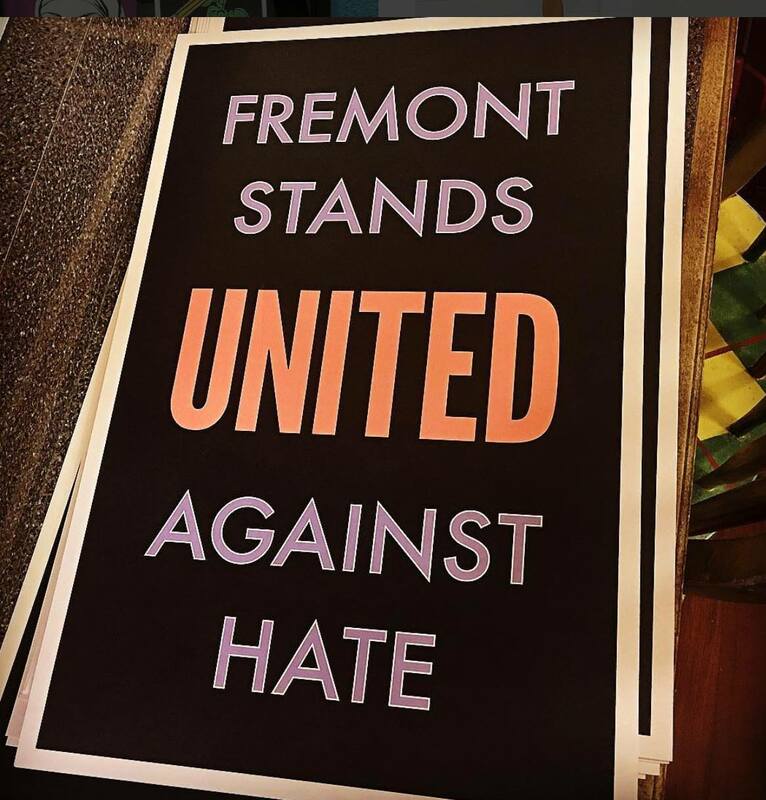 Last spring, “Fremont Stands United Against Hate” posters started springing up in the southern Alameda County city. The poster printing and distribution was spearheaded by Compassionate Fremont and the Fremont City Council even provided a grant for poster production.